Access All Areas members have a fun pack of pattern resources to download this week, courtesy of Irene Demetri from Youandigraphics. These Dots & Spots patterns contains 40 doodled pattern designs that repeat seamlessly to cover infinite areas, making them ideal for use as backgrounds for branding projects, packaging, fashion apparel, posters, leaflets or website designs. Irene Demetri is a Graphic and Digital Designer who loves creating a range of useful resources in her Creative Market store that help make your work easier and faster. Specializing in seamless vector patterns, you can find many selections of pattern designs in a variety of styles with multiple applications, including colourful drawings, geometric shapes and artistic doodles. You can follow Irene on Instagram for all the latest product updates and on Pinterest for some great inspiration resources. 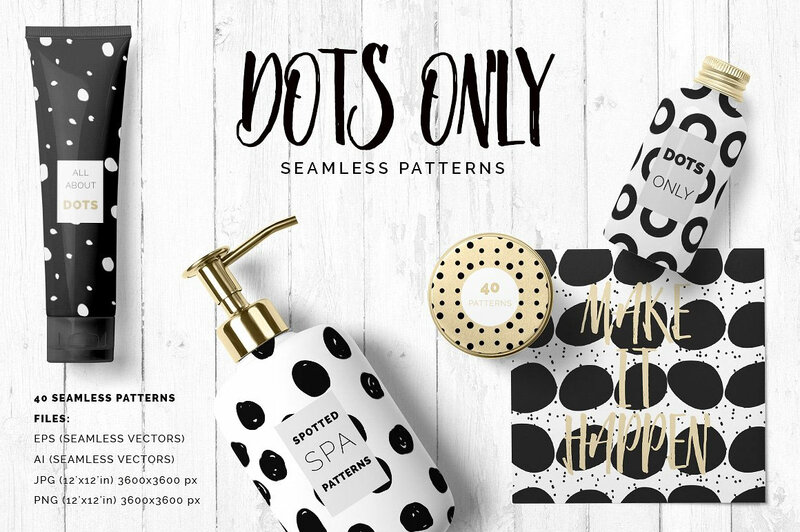 This set of Dots & Spots patterns contains 40 different pattern designs, based on various dotted doodles and geometric circles. Each design comes in vector AI and EPS format, as well as 12×12″ 300dpi JPEG and PNG formats. Detailed guides are are included that show how to use and edit the patterns. Irene is very talented person. Great to see her work here! Thanks for sharing Guys! I love how simple but pretty these designs are. And the gold pairs perfectly with the black and white!